Ohio was only 21 years old when the Ohio Legislature approved plans authorizing funding for an Ohio Canal system to be built. The year was 1825. This wasn't a spur of the moment decision on the legislature's part. In 1822 the legislature commission a study to test the feasibility survey to see if it would be possible to build canals throughout the state to connect to the major waterways namely the Ohio River and Lake Erie. In 1820 there were estimated to be 580,000 in state residents, and most of these were involved in agriculture. The problem with modern agriculture of the day was that farmers had more produce than they could use for themselves, or sell to others living in the area. The best way to keep the family farm profitable was to sell the excess to places that didn't have so much agriculture. Eight years earlier work had begun on building a canal that connected Lake Erie with the Hudson River and ultimately New York City. That opened lots of possibilities and the opportunity for Ohio's farmers and businessmen to sell their goods to a much larger market. No one recognized the possibilities more than Alfred Kelley. It was his driving force and foresight that made canal building in Ohio possible. In 1825 New York Governor Clinton broke ground for the Miami Canal in Middletown, Ohio. This section of the canal was completed in 1828 and the next 17 miles to Dayton was completed in 1830. The Miami & Erie Canal was not initially conceived as a route from Lake Erie to the Ohio River. The Miami Canal was in operation from Middletown to Cincinnati in 1828, and in 1830, the 17 miles were completed to Dayton. The "Miami Extension" to Troy was not started until 1833. To satisfy political demands additional segments were parceled out to contractors until 1845 when the entire canal was open to traffic from the Ohio River to Lake Erie. The primary work force building the canal consisted of immigrants who worked for 30 cents a day, plus food, shelter and a shot of whiskey everyday. The Miami-Erie Canal had 105 locks and was 250 mile long. Loramie Summit was the high point of the canal at 521' above the Ohio River and 395 feet above Lake Erie. Three man-made lakes (Indian Lake, Grand Lake, and Lake Loramie) were created to maintain water levels through parts of the canal. The canal system reached its peak in revenue generation in 1855. At that time the Ohio canal system consisted of almost 1000 miles. It was at this time that railroads were becoming a cheaper and faster way of transporting goods across the country. The increased use of the rail system and later the highway system brought a slow death to the canal system. But it took a natural disaster to completely end the Ohio canal system in March of 1913 when Ohio experienced a record winter snowfall and then unusually heavy rains fell that caused widespread flooding throughout the state. This flooding destroyed many of the canal systems raised banks and locks. Ohio's canal system was dead. Originally there were some 250 miles of canal connecting Lake Erie and the Ohio River. Today less than 75 miles of the original canal system is still owned by the state and this is spread throughout the state in small plots of less than an acre. 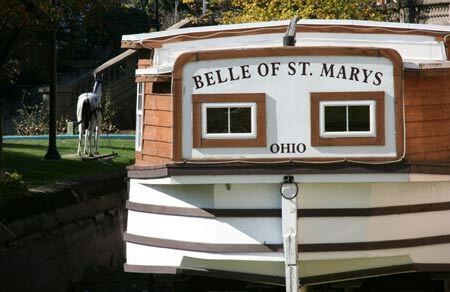 Recent interest in the canals has attracted the attention of small Ohio communities to use what remains of the canals as attractions. The largest watered-section is 44 miles located along the Loramie Summit to just north of Delphos. Another section is just south of Newport. It has not been developed to date, but plans are in the works for creating a hiking trail there. One exceptional area that has been redeveloped is in Grand Rapids, just south of Toledo. Here the Toledo Metroparks has completely restored several miles of the Miami and Erie Canal with one of the only original operating locks still in use today. Rides are frequently given during the summer months on a typical packet boat pulled by 2 mules. 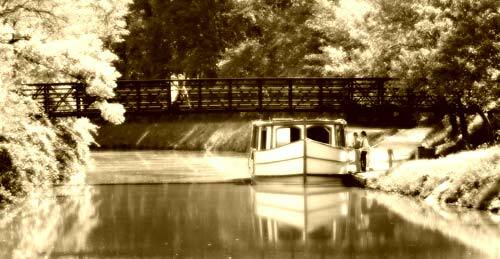 If you'd like to see how a canal boat and lock operated in the mid to late 1800s, then by all means make the trip to Grand Rapids to visit Providence Metropark's Canal Experience. The Miami Erie Canal is starting to see new life in many areas along the original route. In Grand Lake St. Mary's they have a replica of a canal boat sitting in a small section. Efforts are underway to reconstruct the canal to its original appearance. Further north, along the tow path, a hiking trail has been created along the canal. SR 66 has been designated the Miami Erie Canal Byway. This byway follows along the canal corridor from Johnson Farm at Piqua, in Miami County, northward through Minster, New Bremen, St. Mary's and Spencerville, ending in Delphos in Allen County, a distance of 50 miles.